"Monster Keep" (MK), the current design that I have been working on has a bit of a mechanics issue. It has to do with SCORING. Right now a 2 Player duel is played in a 5 x 5 area (square cards). This is much like Tile Laying in Carcassone or Classic Checkers with something akin to King-ing certain cards known as "Command" cards. The ONLY cards that allow you to score are "Command" cards. In your Micro Deck of 12 cards, you get ONLY three (3) "Command" cards. They tend to be unique too... but it's not impossible to have duplicates of Command cards also. In the ROW AND COLUMN that a "Command" card is placed (in the play area), the player tallies up the various cards and scores "Tribute" points (VPs). 1. Do I score based on the three (3) resources a Single Point to the winner of the each position. Therefore the score would vary from -3 to +3. 2. Do I still use the three (3) resources and VARY the scoring based on the various differences. For example: 3 food vs. 5 food. In the previous method, the First Player would score +1 VPs because his Hunger requirement is less than his opponent. However in this second method, the First Player would score +2 VPs (5 - 3 = +2). I'm not sure if IDEA #2 is "too complicated". Idea #1 is simple and makes for scores to relatively easy to compute. But Idea #2 makes abilities and each bonus or penalty that much more "VALUABLE". It adds much more depth in strategic terms. For now, I think I will TRY to use method #2 and see how it goes. In the event that things are HARD to score, I can always revert back to the original idea (#1) with the static scoring. But if anyone has an opinion or cares to leave some feedback... Feel free to comment and ask any questions if I have not been clear enough. I'm unsure about how resources are acquired, but if you allow bonus points for the surplus resources a player collects, then they'll likely prioritize resource collection at the start of the game, leading to a "min-maxing" of their resource pools. They'll blow up with a specific resource and work to have much more of it than their opponent; a second resource will be the "give or take" resource which will have the most competition (and likely be the difference-maker in the end-game scoring), and then a "junk" resource they don't focus on as much. This third would naturally be the resource their opponent maximizes in since there's a least path of resistance to collecting it. I'm not sure if this is what you want. I suggest a simple majority be what you try, and reward a single victory point towards the win for the player with more. I suspect with tighter scores and swing-y majorities, the game will be much more tense. Furthermore, the strategy of min-maxing isn't as effective, since too large of a majority has diminishing returns (you're not going to win more points if you have twice as many food as your opponent, for example). So I suggest you try the single-point rewards and simple majority calculations, and see if that's the feeling you want to bring across. I suspect this is closer to your scoring method #1, as above. Stats are compared to each other based on card position. Suffice to say that "Hunger" must be LOWER than the opponent's card to SCORE (more on that later). "Bloodlust" must be IDENTICAL to the opponent's card to SCORE. "Greed" must be HIGHER that the opponent's card to SCORE. Let's say you scored a "3" in Hunger and your opponent a "5". Method #1 would simply be a "You Win" so +1 Victory Points (VPs). If both cards had a "4" in Bloodlust, you would earn another +1 VPs. And let's say your Greed was "5" and your opponent had a "2", you would yet again earn a +1 VPs. The tally of this matching is +3 VPs... The MOST you can get using Method #1. Now using the SAME stats, let's show the difference using Method #2. This means again A HIGH success rate but +3 versus +9 (Method #1 compared to Method #2). Like I said in BOTH cases this is a VERY successful placing of a card in the Keep. But Method #2 goes a bit further with the mathematics and will make for HIGHER scores. My only concern is the problem with a LOT of scoring is A> Tracking an B> Tallying may be overly complicated (at the end). 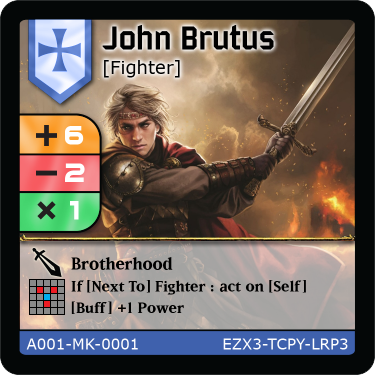 Also look at this "Fighter" card ability: it grants you +1 Tribute. That's +1 VPs if the condition is met. In this case THIS card must be placed NEXT TO (left or right) another "Fighter" card to score +1 VPs. However, if you as a designer are concerned that scoring will take too much time and/or take away from the game, then go for the simpler option unless you really, really have to. If you have playtesters available, have them play the game a few times with one option, and a few times with the other. You may be able to observe all you need, but you can also ask the testers for their feedback on the scoring system. Maybe option 2 is just what the doctor ordered. But I think speculating without playtesting is a lost opportunity. Also, one last suggestion: If Hunger is supposed to be lower and Greed higher, then switch their positions on the character card. It's a more effective way to communicate that one must be higher to earn points, and one must be lower to earn points. Yes indeed ... that's my dilemma. Since it's simple "tile placement" ... I feel like the "blowout, master move and total smack-down" of a card ... Adds a LOT of "excitement". Hey I'm competing with Magic: the Gathering Arena! Well not really(!) But I suppose it would make the game more "swing-y" and therefore most masterful in play adding more tension and excitement. I'll continue to design and when I get the cards from The Game Crafter (TGC) hopefully I will have designed all the cards for the starter kits. And then I can actually sit down and PLAY a couple rounds and see how the scoring in Method #2 works as opposed to Method #1. But as per observation, Method #2 makes EACH POINT count!